A week after La Trobada, at midnight on 22nd June, the fire on top of the Canigou is lit with a flame permanently kept alive in the Casa Pairal. 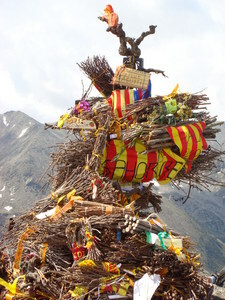 A flaming torch, kept throughout the year at the Castillet in Perpignan, is carried to the top of the mountain and used to light the bonfire which can be seen all over the Conflent. The next day, relay runners carry the “flamme du Canigou” down onto the plain, lighting torches in all the villages they pass through on the way to Perpignan. In the evening, these torches light the “Focs de la Sant Joan” or “Feux de la Saint Jean”, fires that have been prepared in towns and villages all over the region. With the arrival of the torch, and the lighting of the fires, the festivities begin. It is a night for celebration and an important symbol of the unity of the Catalan culture and as such, many towns and villages will mark the event in some way. Contact your local Office de Tourisme to find out what’s going on near you. 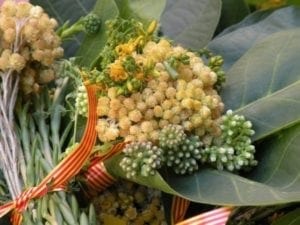 Herbs are traditionally an important part of the Feux de la Saint Jean as it is said that their curative powers are 100 times stronger on this particular evening. Rosemary, thyme, verbena and other herbs are picked and made into bouquets and garlands. Verbena in particular is supposed to have mystical properties and act as an aphrodisiac, whilst carlina (a type of thistle shaped like the sun) is also believed to have aphrodisiac qualities. It is also nailed to the doors to protect from evil spirits and to prevent ‘mauvaises fées’ (bad fairies) from entering the house. Pourquoi le mot “abréviation” est-il si long ?